Doggett's “Iconochrome” series represents philosophically profound messages. In Memphis, Doggett designed “a ribbon of continuity” that wrapped around the entire central terminal. For the first time, airlines allowed their titles to be listed without logos. Doggett saw the logic of using a standard font as a unifying element. 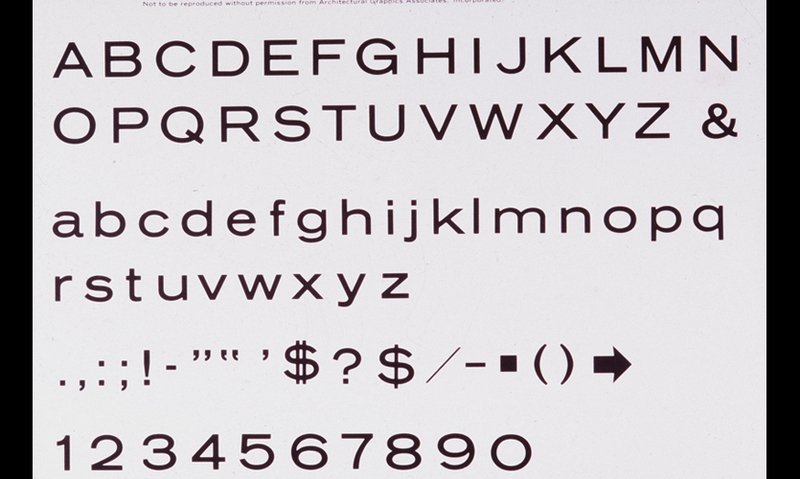 She created “Alphabet A,” adapting it from German Standard, a forerunner of Helvetica. 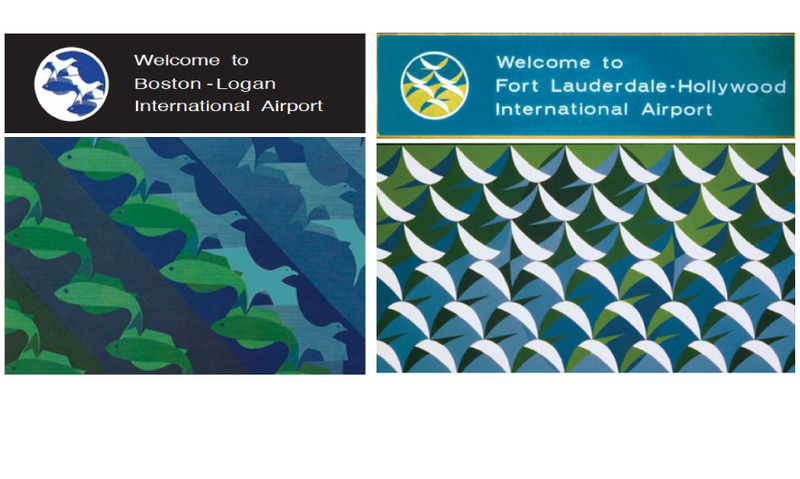 Doggett's Miami International Airport logo was based on the nautilus to express the ocean environment, in bright, South Florida colors. The arch sign support and sculpted landmark reflect the area's Latin American architectural heritage. The Houston International Airport was Doggett’s first multi-terminal complex and the place where she first introduced the A, B, C terminal codifications. 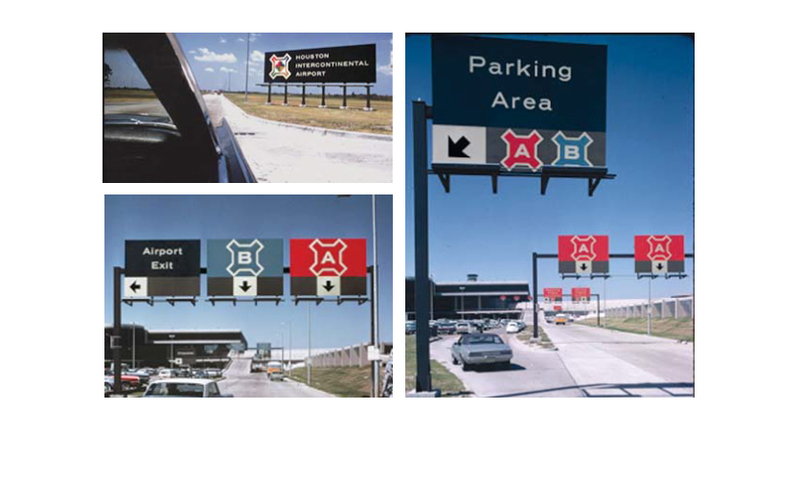 At Tampa International Airport, roadway entry signs demonstrate the effectiveness of color-coding with large symbols for distance viewing. The two-color system at Tampa, which is optimized for color-blind viewers, is still in use. 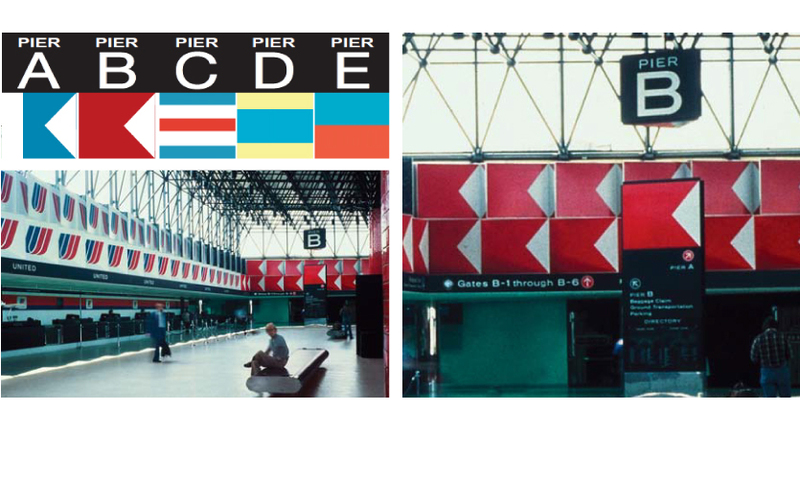 At BWI, Doggett’s coding utilized the nautical signal flag system: each concourse was designated by a separate letter with its nautical symbol displayed to enhance codification. She developed thematic graphics to identify the individual airports as gateways to particular places, reflecting the natural, historic and cultural features of each area. 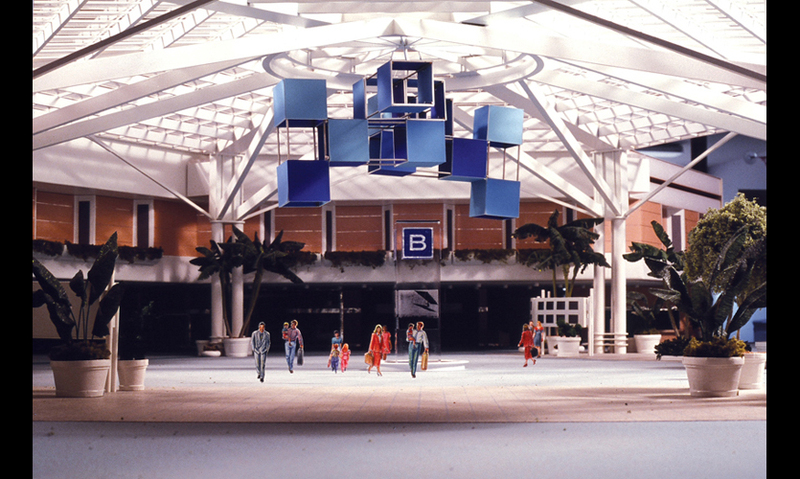 At Orlando International, Doggett created a kite theme. To enhance the theme, she designed terminal placemarkers that integrated letters, colors, geometric containers and kite configurations. 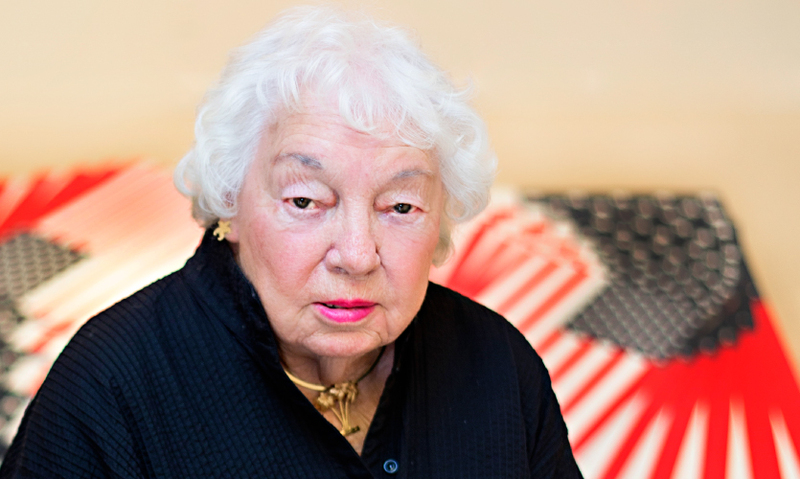 Jane Davis Doggett is a living legend of remarkable talent: both an unsung hero of graphic design who revolutionized airport wayfinding and a prolific artist in multiple mediums. 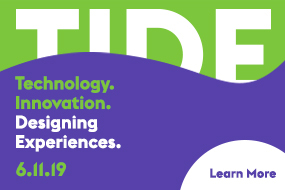 Doggett recently took her place in the canon of SEGD Fellows at the 2018 SEGD Conference Experience Minneapolis, beside experiential graphic design trailblazers including Massimo Vignelli, Lance Wyman, Wayne Hunt, Robert Venturi, Sue Gould, David Gibson, Donald Meeker and Jan Lorenc, among others. 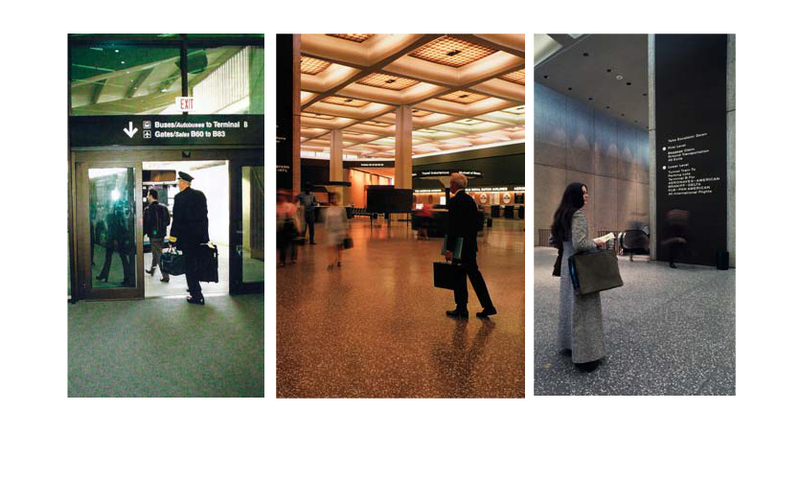 Doggett designed wayfinding systems for 40 major airport projects, many of which are still in use today. 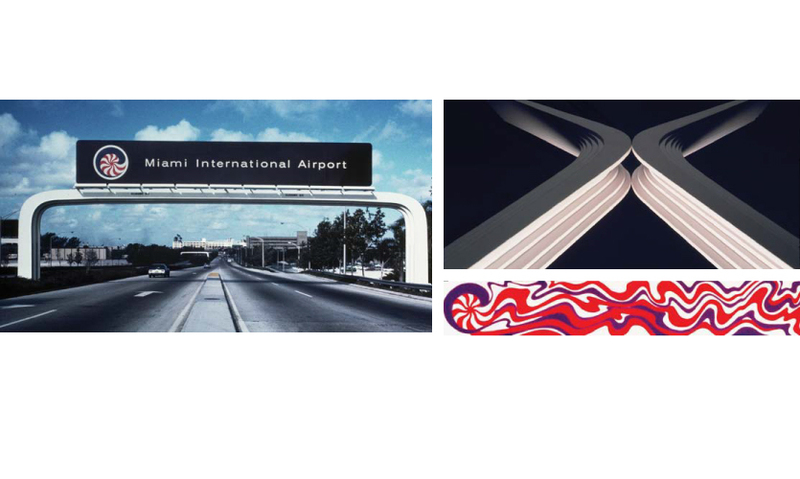 She was also the first to use: color, letter and symbol coding; airport signing on approach highways to increase safety and reduce the number of signs as well as architectural and brand integrations of airport symbols. Doggett is a native of Nashville, Tenn., who first attended Newcomb College at Tulane University, later earning her MFA from Yale University School of Art and Architecture in 1956. At Yale, she studied architecture, color and graphic design, most notably under Louis Kahn, Josef Albers and Alvin Eisenman, whom she considers major influences, together with her contemporaries, architects Frank Gehry and Bob Stern, painter Jasper Johns and late graphic designers Ivan Chermayeff and Sam Antupit. 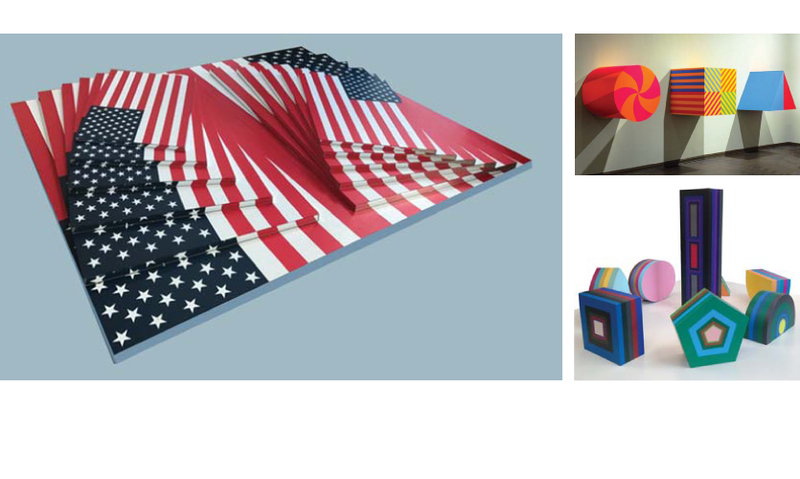 In addition to her work in airports, she has worked on prominent design projects and wayfinding programs for museums, convention centers, performing arts and public transportation systems, all while maintaining a creative hand in fine arts. She counts the ever-changing seascape of Atlantic Maine and Florida and southern architecture among sources of inspiration for her artwork, which has been exhibited in museums and art centers nationwide. Doggett is the recipient of numerous accolades, to include: the Sterling Fellow Award (Yale University), Outstanding Alumna Award (Newcomb College), Lifetime Achievement in the Arts Award (Arts Council of Martin County, Fla.), National Award of Merit (AIA), Progressive Architecture Award (AISI Design in Steel Citation), two Design Awards (US DoT and NEA) and was inducted into the Florida Artists Hall of Fame in 2016. Her extraordinary accomplishments notwithstanding, Doggett was grateful for the recognition from SEGD. “It’s been rewarding to me to be recognized in my field with this honor from SEGD,” she remarked. “I’m extremely proud of it.” And, she says the fellow award is especially gratifying because she has endured a certain amount of anonymity in her career—students often study her work, but do not know her name. Approaching age 88, Doggett is making and showing art and giving talks about her work. She’s sharp and witty, too—cracking jokes in her charming Tennessee accent as we discussed her life and work. Tell us about your youth like in Nashville—how did you become interested in graphic design, specifically? Well, it happened quite naturally because I just drew all the time. To keep me occupied in church when I was little—four and five, you know, squirmy ages—my mother would give me a pad and crayons. I call it ‘my Crayola period.’ And even now, my heart skips a beat whenever I see a package of crayons. We ate them too, you know? I guess the wax didn’t hurt us. One day, I discovered that the backs of hymnals had blank pages, so I began to fill those. When it was discovered I was drawing in the hymnals, my mother had to purchase them and so I think it cost quite a lot for me to become an artist. I drew in the backs of my mother’s books, too. 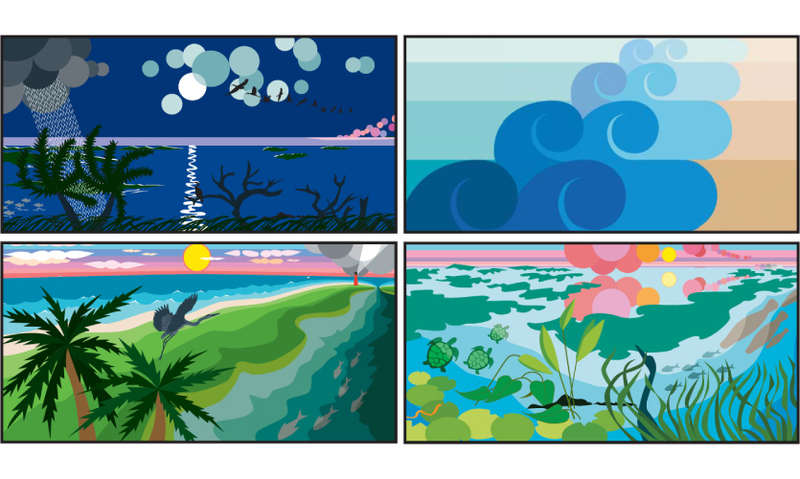 That was my beginning in graphic arts. I suppose it was a graphic urge to draw in a book, so I would be quote ‘published.’ I had the support of my family always; my parents knew that I was gifted. Was it difficult to be a woman in the design field in the 1950s and 60s? I am frequently asked this question: there were only a few things along the way that I can remember [being issues]. I don’t feel that I was ever blocked in my career. It seems to me, that maybe I was respected for the fact that I could bring talent to the table. My Yale colleagues gave me great support—they would tell me about projects and prospects—and knew that I was working to build a bridge between architects and graphics. I did not feel I was going against the grain, because philosophically we were thinking about women coming into the fore anyway. I think it was in the air. Women ought not to feel threatened by those types of problems; if they are prepared, they’ll be respected. The experiential graphic design field is nearly 50 percent women now. Back then, women made up about five percent of architects and engineers; I was frequently the only woman at the airport planning table. But then, I was doing a new thing—architectural graphics, as I called it originally—which became environmental graphics. I think a logical expanding of the field and it happened quickly, because they were building airports as the jets were coming down the assembly line. It was really great to be contributing to a pioneering period of something as important as this. Here’s the deal: It was wonderful, I had a marvelous adventure in the Jet Age. What does wayfinding mean to you and why and why do you think it became such a big part of your life? Wayfinding is more than just putting a sign up, it’s a series, a sequencing of information in continuity. You’re working with sequencing of signs or lighting or whatever means in the environment to persuade the movement of traffic. That thread of continuity, which can be created with signs put in the right place for viewing by car or by foot, that to me is what ‘wayfinding’ says. As a term, I really like it. At Yale, we were envisioning a future of really large complicated spaces. I could see the need for being able to manage those from a human level—I was thinking about experiences in the built environment and human scale. I remember knowing my ideas were right on because I could see what was being done architecturally under Louis Kahn—what was being envisioned—and it was big. When I had the opportunity to work on the Memphis airport Roy Harrover and I were these young kids from Yale. We were shocked out of our minds that we got the project, but I guess young people always think more positively. After that very successful, award-winning airport, I was selected to do Houston. My fellow classmates from Yale, Ivan Chermayeff and Tom Geismar were also competing for the Houston airport. The reason that I got it I’m sure was because of the outstanding graphics I did for Memphis. It set my course to do an awful lot of airports. Tell us about what was special about the Memphis Airport. 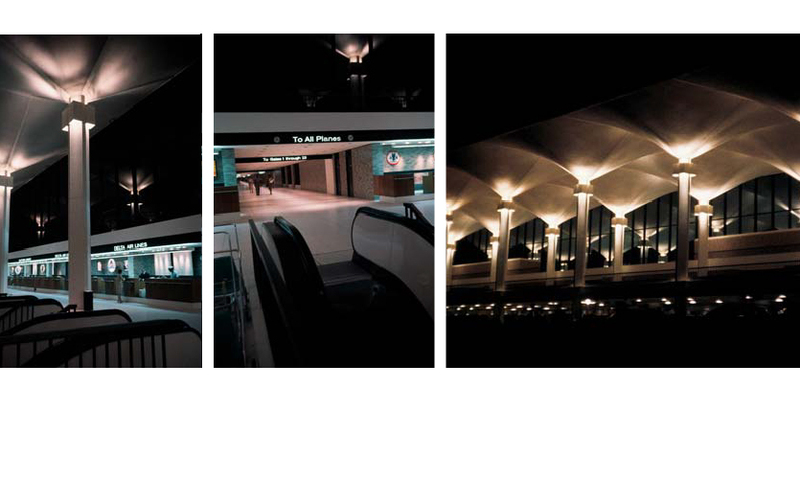 The Memphis Airport was a first at the time. We were able to do an awful lot in that particular facility that set graphic standards—we created the band with a common alphabet and I used German standard typefaces as my source [for ‘Alphabet A’]. I recognized that if you were looking at a continuous horizontal band, particularly at an angle, that vertical stroke or tight condensed letters would ‘close in’ and become hard to read, whereas your expanded more square-cut ones would retain good definition. I knew this from my studies at Yale; we were given a terrific basic training in typeface design. We created signs that spanned corridors overhead, instead of positioning them where people could block lines of sight. That became the standard at Memphis and carried over to Houston. 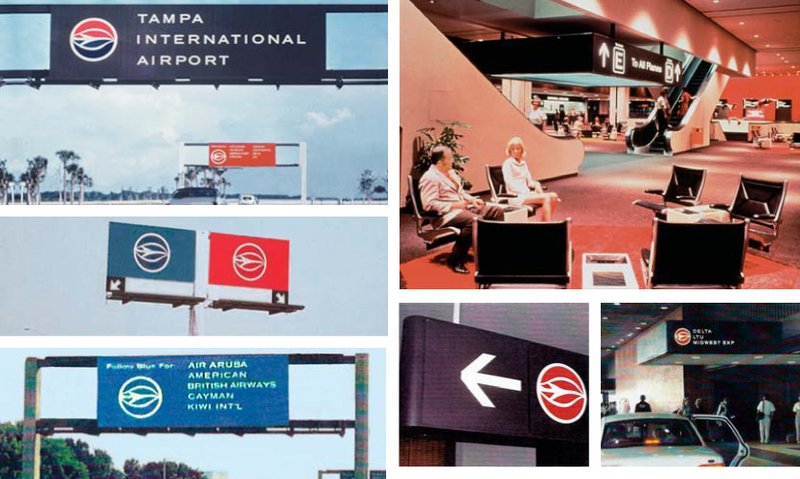 Many of the airport wayfinding innovations you worked on, we take for granted today, like color, letter and symbol coding and the optimization of typography. Was it a revelation at the time? Roy and I went to look at several airports and they were terrible—they looked like penny arcades. The airlines didn’t help because of their secrecy and corporate competition, which is just good old America, but the thing is, eventually they had to work together in a terminal. The jet age grew so quickly, that’s why I think there was a disorder from the public point of view. 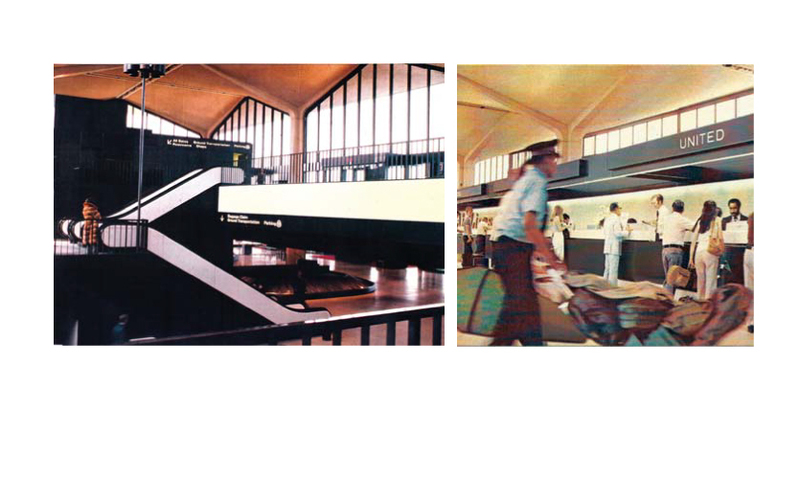 The technology was so remarkable and when it happened, there was no airport ready. If an airline needed a sign, then they would go to a sign maker, who usually had no graphic design education; there was really no such thing as a graphic designer involved. It was serendipitous; I was at the right place at the right time. Unlike the sign makers, we always used a system. 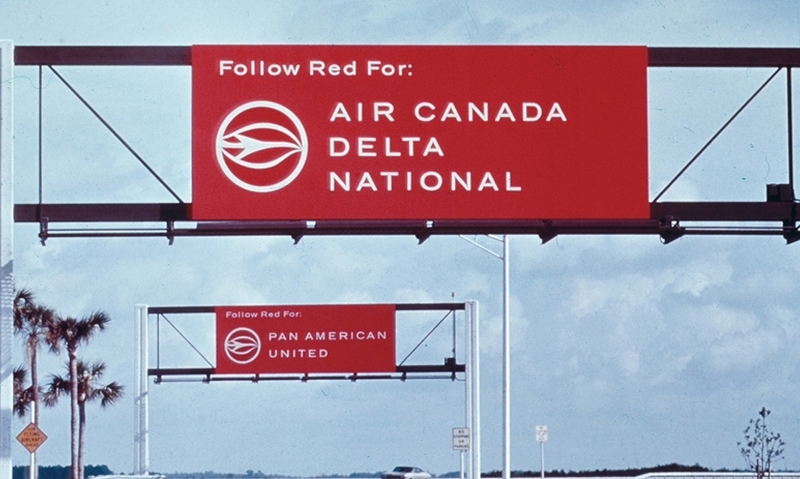 We used color coding, letters or numbers and we grouped the airlines to a big letter A, D, or U, for example; Delta liked to have terminal D. We did a two-color system in Tampa that is working to this day—they are still using the A and B system with this big expansion—because it’s still working! I put more emphasis on sign system continuity on roadways, with design innovations in the supports with sign boards integrated, the one at Miami International is a perfect example. I think that was really a first—because previously it was the realm of the engineers with their manual and green signs, where graphics would start with architecture at the terminal. But we discovered that people were driving into the airport not knowing where the hell they were. I remember the worst thing was when I was working on an airport that had just a straight approach roadway: There wasn’t enough space and time for the signs! A curve off the highway would have made a much better flow of traffic, but the engineers were so proud, saying it will save money and pavement to have a straight approach with a T intersection. It made nothing but a traffic jam. So, signs are done in continuity with the roadway formation. There’s an exchange between those two things and you sometimes need more roadway to display your messages; the fastest way to get there is the communicated way—not necessarily the shortest physical distance. What compelled and propelled you to pursue these design concepts that many others weren’t concerned with at the time? I think that it had a lot to do with the demands for various destinations. Because the airport became so much busier and offered so many more choices, it did lay stress on the graphic designer as a signage programmer. An airport is rather like a city, with restaurant choices, retail and integrated marketing into the facility. And, Americans want to drive everywhere, so the parking and rental car facilities have become just like separate terminals. I believe some airports make more revenue on parking and rental cars than they get from the airlines. What role has testing played in your work? In the beginning, there was a lot of testing. One example of testing ad nauseum, happened on a project for the Newark Port Authority, where we were working with the engineers who essentially invented I-95, to include Lou Bender. They were responsible for those green signs with letters made of reflective buttons—they predated 3M’s reflective coating, which at least preserved the integrity of the letter form. We had to test our alphabet against the interstate alphabet, because the architects wanted to use the same lettering outside and inside—and we did, too. So, we had to test it. I can remember one of the guys that worked for me was so game—he went up on a catwalk spanning six lanes in Newark to put up the test sign. All of a sudden, here came this huge storm of rain and lightning as he was putting letters up and he was soaked and nearly electrocuted! But we had to test, because it was the Jersey Turnpike—you were supposed to get to heaven that way, I think. It was Bender’s baby, and here we were coming to do an airport for the Port Authority in Newark. We were going to put in these things with color on them and with symbols and letters. We were violating the Jersey Turnpike standard for God’s sake! Obviously, you never really retired: What has been your continuous source of inspiration and energy? I don’t believe you ever stop being an artist. Between travel, the internet and other various communications media, so much information comes to us. There are a lot of sources of inspiration and exchanging of different cultures and it’s a refreshing thing. We’re cutting down the barriers of language when we use symbology and color in signage. They recently discovered that Neanderthals were using some symbols. That is thrilling, because symbolism was the beginning of language! As an artist, I'm always going to have ideas. What would you tell someone interested in the design field? I don’t mind saying it: I do think that there is such a thing as talent. But, with any of your gifts, you have to apply them: You have to have good education. It would be a pity if you didn’t or weren't able to follow your gifts. People with talent start out early drawing and looking at the world in dimension, and so forth. The more you practice, the better your vision becomes and the better you can see dimension. We all know people who have been discouraged from going into art and design. It hasn't always been thought of as highly as the medical field, legal field, hedge funds, or whatever things people might want their children to do to make money, but, you can certainly have a good life in art, design, architecture and engineering. I don't know where we'd be without them. >> Watch the video of Jane Davis Doggett’s acceptance speech. >> Meet more of SEGD's distinguished SEGD Fellows, including Massimo Vignelli, Deborah Sussman, David Gibson, and many others. 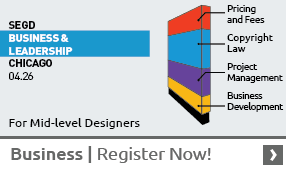 >> For more great EGD/XGD content in your areas of interest, discover SEGD's Xplore Experiential Graphic Design index!